Like a lot of people, I've adored watching reruns of Rod Serling's The Twilight Zone and waited eagerly to hear the writer-producer-host's voice informing us that something eerily unexpected was about to happen. With his well-fitting suits and unsettlingly calm delivery, it seemed as if Serling was almost marveling at his ability to shock both his characters and his viewers. If most of us knew him as a suave presence on the small screen, his daughter Anne has a far different memory of the man who wrote insightful and gut-wrenching television plays like Patterns and Requiem for a Heavyweight and the who adapted Seven Days in May and Planet of the Apes. Her genial father is sometimes tricky to reconcile with his sometimes grim public persona. 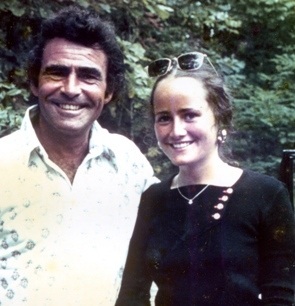 Serling was only 50 when he died in 1975, and his daughter was only 20. Nonetheless, the younger Serling has astonishingly vivid recollections of him and has worked to preserve his formidable legacy. Having written some poetry and worked as a preschool teacher, it's inevitable that she's try following in her father's footsteps. She's written a forthcoming book called Another Dimension, which deals with how losing him affected her and explains what sort of mind could create both The Twilight Zone and Night Gallery. Portions of it have been excerpted in Salon. I spoke with her by phone two weeks ago, and if her book is half as engaging as listening to her talk about her father, it should be worth reading. After reading your piece in Salon, would it be fair to say that you discovered your dad's work the way most of his fans have, which is long after he was gone? Yes, that would be very accurate. I knew what my dad did for a living. I knew that he was a writer, but I never knew exactly what he was writing until actually I was about 7 years-old and some mean kid on the playground asked me if I was something out of The Twilight Zone. I had no idea what that meant, so I went home and asked my dad, and he explained to me that he wrote for a (television) series, and it was a little too old for me. And then, it was probably about a year or so later that I saw my first Twilight Zone, which was "Nightmare at 20,000 Feet," and I watched it with my dad. "The Nightmare at 20,000 Feet" -- 1963 Version from Dylan JamesT on Vimeo. Needless to say, I was terrified. It was a consolation that he hadn't written that episode (Richard Matheson had). He appeared before and after the show started. It was a long time after that, that I really started to watch and really started to connect to the show after he died. What really surprised you when you were finally able to sit and watch the episodes? As I wrote in that article, with "In Praise of Pip," the dialogue was almost identical to this little routine that my dad and I had. "Who's your best friend?" Certainly that was initially what really knocked me out and watching other episodes and seeing, for instance, his Twilight Zone "Walking Distance," which is so autobiographical. My dad really had this longing to go back in time, I think. He had this idyllic childhood, and then he enlisted in the war (World War II) the day he graduated from high school. As it did with so many kids that go to war, it altered something with him significantly, which is why he originally majored in phys ed. But because he was traumatized by the war, he switched to literature and writing. So with "Walking Distance," "A Stop at Willoughby" and all these things where you're going back in time. My dad was a very passionate guy, and he felt very strongly about things, and so that's what I felt when I started to watch these shows. An excerpt from "A Stop at Willoughby," written by Serling himself. It's a cliché, but so many people say this. He dealt with the human condition. That matches the two quotes you showed me earlier he had about working on Requiem for a Heavyweight and In the Presence of Mine Enemies. He was adamant about making sure the character were not completely good or evil. I'm still haunted by the shot of Charles Laughton (as a rabbi) putting his hand on the other guy's shoulder, and he's a Nazi. When that show came out -- I don't know if you know some of the history, but Leon Uris was furious and actually called it something like, "the most disgusting presentation in the history of American television." I guess there was sort of an avalanche of complaints about the show. Another writer on The Twilight Zone, I can't remember who it was, really defended my dad. Later, my dad was quoted in a speech that he gave in Washington saying that it's the writer's role to menace the public's conscience. I think that's part of what he tried to do. He hated stereotypes, so I think that came through in that show, particularly. As much as I loved watching The Twilight Zone as a teenager, I really like it now because of all the veiled social commentary. It must have gone right over people's heads at the time. I think it had because there was so much censorship. He tried to write about Emmit Till, and he couldn't do that. There was some show that he wrote about, and it showed the New York skyline with the Chrysler Building in the background. And they had to black that out because the sponsor was Ford. There was this ridiculous kind of censorship. There's a quote that he gave, "An alien could say what a Democrat or a Republican couldn't." Through The Twilight Zone, he was able to slip all of this under the radar, and they didn't know really what the hell was really going on. He could say what he wanted to say, finally. Even though he's known for science fiction today, I read in an interview with your mother that he didn't have a big collection of science fiction books. A lot of the Twilight Zones really weren't science fiction, necessarily. I don't know how to answer that. He liked fantasy. I know one writer he liked was H.P. Lovecraft. Not many of us have had the privilege of having our writing critiqued by a multiple Emmy-winner. How did your father respond to your writing? He was very kind, but I knew if he said, "interesting," I knew it wasn't terrific (laugh). But if he really liked it, boy did I know. He would never say, "Oh, that's lousy." "It was interesting." There was still a little hope there. Was it tough to go back into your own memory to write this book? As I said earlier, when my dad went to Antioch, he switched his major, he said, "I think I need to get this off my chest" because writing was cathartic for him. It was also for me, dealing with my grief when he died. A lot of the book was getting through my grief and getting to know who he was to the public, also. It was sort of like this dual journey I went on. He grew up in Binghamton, (NY) and every summer he would drive back and look at his old house. His dad died when he was in the war. His dad died at 52. Even when the war was over, there was this point system, so my father couldn't return for the funeral. And he was really close to his father, so there was this unresolved grief. That was all part of what happened with my dad choosing writing. Your dad was still a public figure and was still active at the time of his death. Do you think it might have been harder for you to lose him because, even though he had a heart problem, he was still relatively young? Right. I know he was afraid the (open heart) surgery. It was very new then. I knew he thought he'd survive. I know he did. 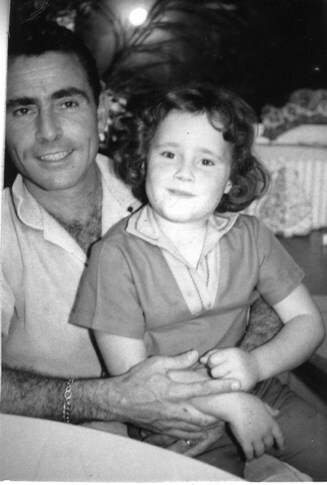 In my own mind, I had no doubt in my mind that Dad would pull through. It was such a shock. He looked so healthy and tan. When I looked back, and I talked about this in the book, there was a period where I looked back at the pictures, and I could see something in his eyes that I could see that I hadn't seen at the time. But we still thought he was going to be writing and active and looking forward to the future. Even though Night Gallery isn't as fondly remembered as The Twilight Zone, an astonishing number of talented people went through there. Steven Spielberg directed an episode your dad wrote. That was "Eyes" with Joan Crawford. That was actually his first directing job. In terms of Night Gallery, I remember this clearly. The producer was a man named Jack Laird, and I can remember my dad saying this man's name through gritted teeth. It was a contentious relationship. The problem was that my Dad didn't have control over Night Gallery like he did with The Twilight Zone. It really wasn't the show he'd wanted. Did he bring a lot of work-related things home with him, like you just described? That's the interesting thing, and I wrote about this, too. As a child, we had this doghouse, and my dad and I used it as a playhouse, and I remember my dad and I sitting there, and I would pour him imaginary coffee. At the time, I had no idea all the stuff he was dealing with at his work with the censorship and trying to write meaningful things and being battled every step of the way. I didn't see that. He worked 12 hours a day, but I never felt that he wasn't accessible or that he wasn't present. He was just a really fun dad. That sounds fascinating because a lot of us who knew him from TV would see him and think that something weird would happen simply because he was around. My friends that met him had apprehensions that it was going to, "Oh, my God. It's going to be that guy from The Twilight Zone." My friends adored him when they met him. But my dad just had this way about him that drew people in and made them feel comfortable. They just adored him. He wasn't the man that you saw walking across that stage. He was very funny, and if you talked to people who met my dad walking into a store and they'd say how warm he was and gracious, took the time to say hello. Just a nice, nice guy. So do you think that might have been one of the reasons why The Twilight Zone was such a magnet for talent? Richard Matheson (I Am Legend) wrote several episodes, and your dad wrote one called "The Bard" where a Marlon Brando-wannabee-method actor was preening across the stage, and it turned out to be Burt Reynolds! A lot of people got their start there, like Robert Redford. One I was watching a couple of weeks ago, "In Praise of Pip." Jack Klugman was so fabulous in that, and I read a quote from him where he said that he loved to deliver my dad's lines because they just were so sharp and clear. He went on to say how devastated he was when my dad died and that he loved them. I was so moved when I read that. During the early 1950s, he was dubbed "Television's Angry Young Man." It's hard to reconcile that image with your descriptions. I guess he couldn't bring his frustrations home with him. I was well aware of what he thought of that Night Gallery producer. At the same time, there were some very good Night Gallerys. "They're Tearing Down Tim Riley's Bar" was a great one. Again, the theme is going back in time. There's another one, "The Messiah on Mott Street." Catching the kinescopes of your dad's live TV work is really fascinating because the actors didn't have another chance if they bungled a line. There was this funny story I read. One of these directors would recall that he'd get so emotional if one of the actors would flub the line. He would exhale and make these noises, and they finally had to tell him that you need to get off the set because he was so upset (laughs). Why do you think I can watch Requiem for a Heavyweight and still get involved despite the grainy kinescope format? I wonder if it's because of the human condition, and these are timeless issues. Even in The Twilight Zone, they were unordinary situations, but they were ordinary people. All these issues are still relevant: prejudice, scapegoating, mob mentality, they're all happening today. In fact, the entire fifth grade in Binghamton studied a program called "The Fifth Dimension," where they watched The Twilight Zone and learned these issues. It's really great, and I think of all the awards my dad got, I think this would be his greatest accolade. He never really thought his writing would stand the test of time. He thought it was momentarily adequate. I think all these years later that these fifth graders are watching these Twilight Zones would have just blown him away. When you look at Patterns, a lot of Occupy Wall Street people would just salivate over that because people are willing to screw each other over for quick monetary gain. Right. When that aired, my mother was pregnant with me, and they left my sister with a babysitter, and they had moved to Cincinnati. And they told the babysitter that nobody would call, don't worry. When the show aired, the phone never stopped ringing. They had no idea that it was going to be such a success. The one thing about that format, at least to me, is that it's easier to sit and listen to people just talking. A lot of your dad's stuff is very dialogue-heavy. What's interesting is that the Paley Center about two years ago did a reading of my dad's with Luci Arnaz, her husband and Fritz Weaver, who was actually in a couple of the Twilight Zones. And just reading this on the stage -- no props, no special effects, no nothing -- it was powerful, and the audience was very responsive. Your dad also started in radio, too, which may have also been a factor. Which may have been what Jack Klugman was speaking to, as well with my dad's words and how sharp they were. I do know what you're saying about dialogue because several years ago when our kids were -- oh, I don't know -- 14 -- actually they were younger than that, we rented the movie The Birds, remember that movie? I remember being terrified in that movie, and our kids just sort of laughed because there was so much dialogue and, of course, the special effects back then were nothing like today. With The Twilight Zone, I think part of the reason it survives is the direction, the writing, the camera angles were so effective. There was a quite a range of emotion in his work because while you love "Mountain" in Requiem for a Heavyweight, it's striking how in the "The Monsters Are Due on Maple Street," the people in that story don't need outside agitators to destroy themselves. Exactly. You know, when the teacher showed "The Monsters Are Due on Maple Street" to the fifth grade class, she said, "Who are the monsters?" And the entire class stood up. I've been on the site for the Memorial Foundation (www.rodserling.com) got a kick out of listening to your dad being interviewed by Mike Wallace right about the time The Twilight Zone was starting. That was a tough interview, wasn't it? He was very good. I read somewhere that he had a raging earache during that interview. He did really well when you consider that Wallace himself said to him, "Well, you're not going to be writing anything meaningful anymore, are you?" My Dad was really wary because they were trying to get The Twilight Zone launched. He was trying to be very careful in choosing his words. I've always thought that was a tough interview with Wallace. The sheer volume of what your father produced is staggering. Is it tough to keep up with it. It is. Imagine what would have happened if he had a computer. Some of his The Twilight Zones were even comedies. How successful do you think they were? I know he did one with Carol Burnett called "Cavender Is Coming." Somebody had sent me a copy of a letter he had written to Carol Burnett saying how sorry he was that the show was so bad, and he would buy her a pastrami sandwich. She said something like, "Oh, it wasn't so bad, but I don't like pastrami." I've seen a couple of the comedies, but I don't think they quite worked. I like his dramas so much better, but even as a teenager, you know that phase where your parents start to annoy you? I never went through that stage with my dad because I always thought he was the funniest person I'd ever known, to this day. My mother used to say, "Stop laughing at him. You're just encouraging him." How did he write his stuff? He used a Dictaphone. A friend told me that my dad told him that he would act out all the characters when he was using the Dictaphone. It's something I do, too, when I write. I'll say things out loud. It does help. I think when my husband walks by he thinks I've lost my mind (laughs). Because he did so much, is keeping up with his legacy a full-time job? I don't know if this relates to what you just said, but I know that when my dad would see some of these Twilight Zone episodes in syndication, he was livid about what was being done to them. They were being cut. They were not presenting the story as it was. Did it take you a while to get comfortable with this book to where you could show it to publishers? It's being shopped now. Originally, I started a book called "In His Absence," which I started 20 years ago. I guess I never worked through my grief and never finished it. This book, Another Dimension, I started four or five years ago, and it's taken a while to get it complete. In an earlier version, I hadn't talked about my grief a lot, and my editor said your grief is so central to this story, to this book, you really need to pull that out more. I was a little reticent about that because it's so personal. But I did. Actually, when I did a reading about a year or so ago -- I hadn't completed the book. A woman came up to me afterwards. She told me her father was dying, but after hearing me read, she knew she'd be OK. I so overwhelmed and so touched by that, all I could do was hug her. I was so moved that I had helped her in some way. We all grieve. All still photos courtesy of Anne Serling, used by permission.